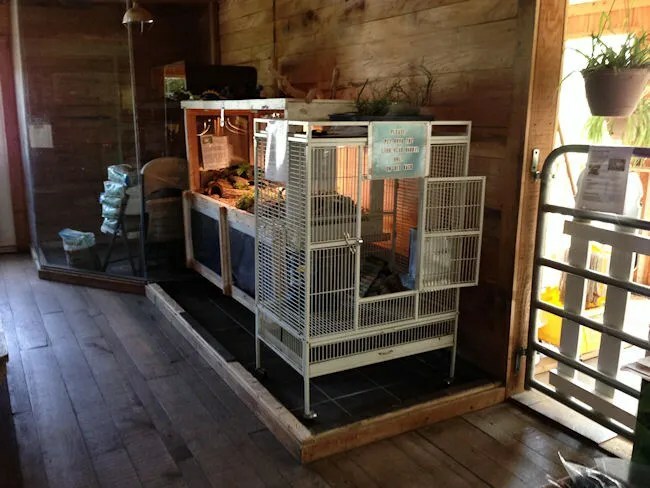 A few years ago, someone told us about a free petting zoo in Three Rivers. The annoying thing we found is that there is almost no info about this place online. Whenever I did a search, I’d come with stuff from 2010 and newspaper articles talking about the zoo falling on hard times. 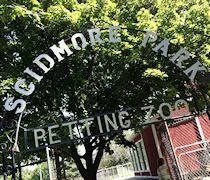 Earlier this month, I somehow stumbled on Facebook page for the Friends of Scidmore Park Petting Zoo. At least I knew it was still open, but again, there was very little information and no information on when it was open. We really wanted to check this place out with L, so I put a message on their Facebook wall and got an answer pretty quickly. The good news was that it was open Saturday and Sunday from 10AM to 5 PM. Three Rivers isn’t all that far from Kalamazoo, so heading down there before I had to go to work on a Saturday wasn’t going to be an issue. J woke me and we got out of the house by a little before 11:00. We arrived at the large park on the corner of Michigan Avenue and Spring Street just to the west of downtown. We found a little parking lot off of Spring Street which is situated between the petting zoo and a really nice playground that we let L climb on for a while before we left. 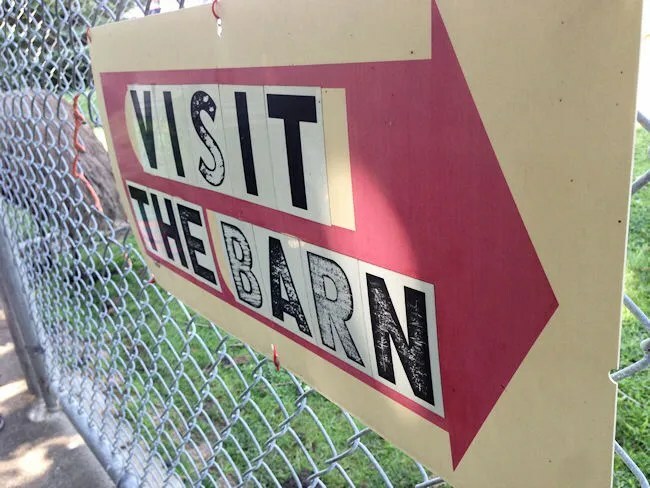 The Scidmore Park Petting Zoo isn’t huge, but there is plenty for little ones to do….especially for free. We walked through the gates and found a pen with an emu and an alpaca. The alpaca didn’t really want anything to do with us, but the emu was ready to get up close and personal. There are little cutouts in the fence so you can feed the animals in this pen and L kept trying to reach through to pet the emu. Just as the words, “Don’t touch his mouth” were coming out of my mouth, L reached up to the emu’s beak and it pecked at her. It got in a pretty good shot and L ran right to mama. She started laughing about it as soon as she was close to mama. It didn’t hurt her at all….just scared her a little and we all had a pretty good chuckle about it. From that pen, the path leads in to the main barn. In the big red building, there are many opportunities for petting different animals. There are turtles, lizards, a bunny rabbit, a hedgehog amongst other things, but all the kids were interested in the not on display kitty cat that was in the office in the corner. 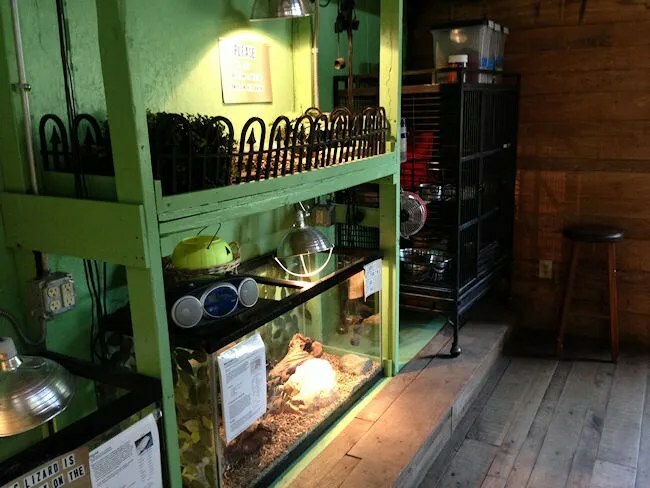 We eventually did get L to pet the turtle’s shell and the two lizards that were in small aquariums on the table. She just kept going back to the kitty in the window that she couldn’t pet. On the way out of the barn, they had a little station up with ice cream cones full of pellets to feed the animals outside. We dropped a few quarters in the box, grabbed a cone, then headed outside. Right outside the door is the pig. 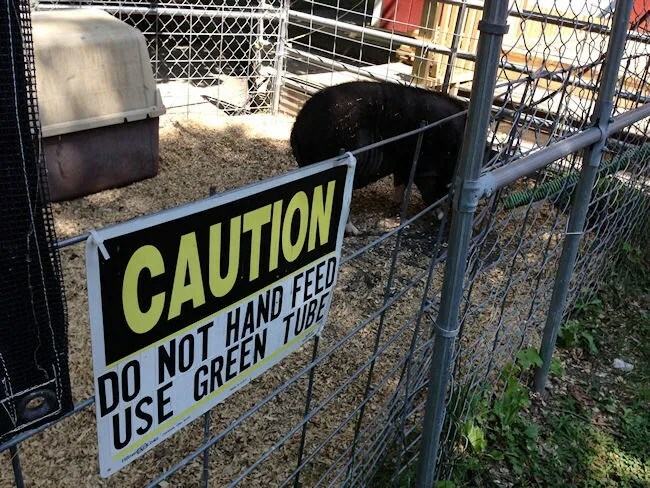 They don’t actually want you feeding the pig out of your hand, so they have a little tube set up that you can slide the pellets down. L still stuck her hands through the fence and tried to pet the pig who just kept sniffing her hand. 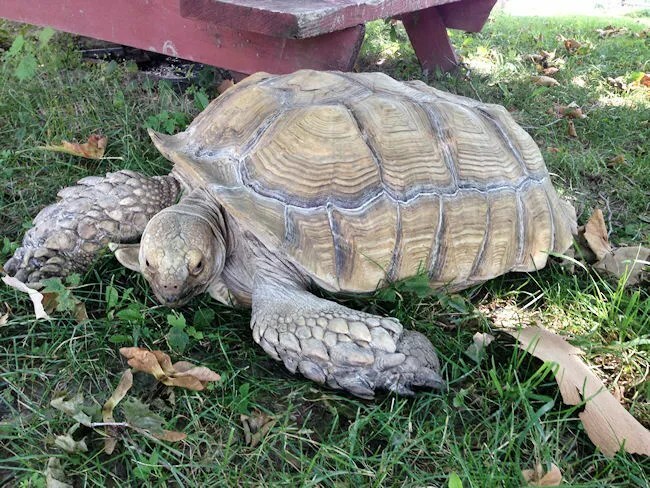 I turned around from the pig pen and noticed a giant turtle sitting over by the picnic table…..just lounging there minding his own business. I got L’s attention and we walked over to him. 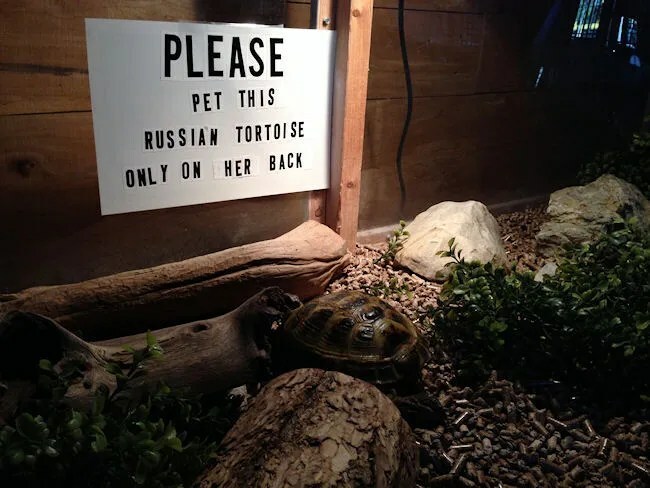 The turtle is probably bigger than she is. I knelt down next to it to show her it was ok to touch his shell. She inched closer and very hesitantly rubbed the shell before walking away and squealing. 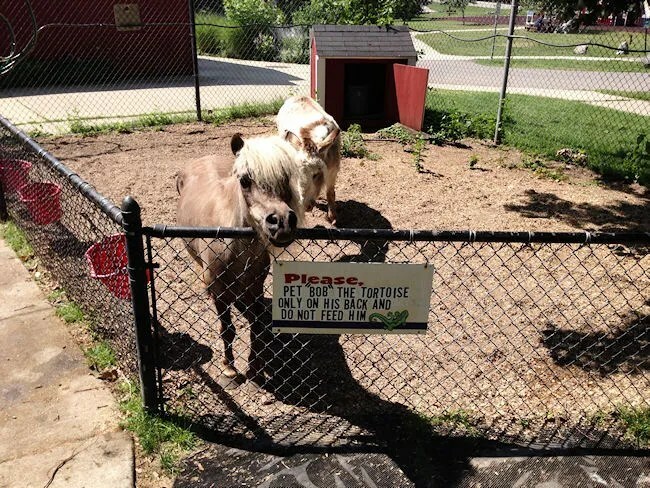 The last pen on the way out of the petting zoo is a donkey and a miniature horse. These guys saw the cone of food in my hand and came right up to the fence. I was trying to show L how to hold her hand out with the pellets for the horse to take. He didn’t have the patience. He just grabbed both of our hands and sucked the pellets out. We were both left with a slobbering mess of a hand. L, of course, giggled at the horse who just tried to eat our hands then asked for more. I gave her another handful and she again held it out for the horse that came right back and opened her hand with his tongue to get a the food. We actually went back in for another cone of food so we could feed the donkey too. When that was done, we headed out the gate and back towards the car. I noticed a donation box back near the entrance, so I went back and slipped some cash in. I always feel a little guilty at these free attractions because L always has so much fun I feel like we should be paying for it. 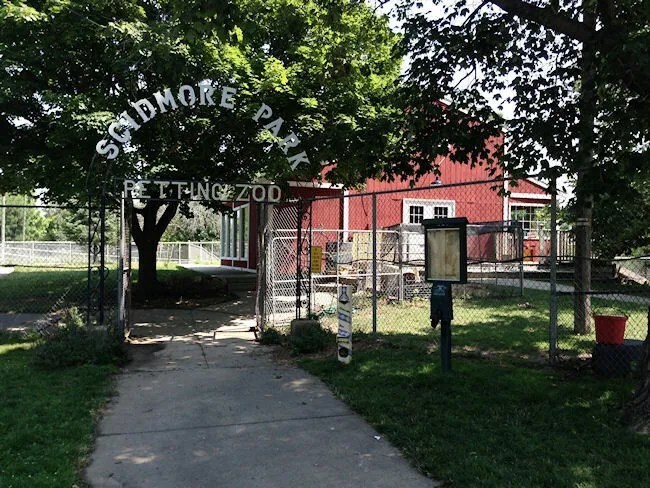 The Scidmore Park Petting Zoo is a great little attraction in Three Rivers. They’re not huge and they don’t have a lot of animals, but it is very hands on and all the kids we saw there today loved it. Like I said earlier, Three Rivers is not that far from Kalamazoo….it’s a nice little weekend activity for us wen we don’t always have time to go somewhere big. Hello. Are you open today October 10, 2017. If so what time? I’m pretty sure they’ve closed for the winter. We were there a few weeks ago on a Saturday and they were already closed up. When I was a Kid (1982), they had wolves. If you walk around the park, you can still see where there are cages from what clearly used to be a bigger zoo.